After some last minute scrambling, the Hill Country Women of Words met at the home of Liz Eberle, who graciously opened her doors with only a three-hour notice due to a schedule snafu at the apartments. I promise to stay on top of things next month! Thank you, Lord, that we can always depend on Liz! 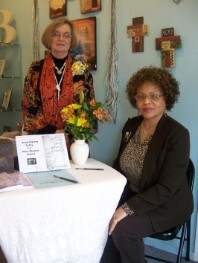 Mary Eckert’s book signing at The Closer Walk on March 6th was a big success! Isn’t Peaches a lovely woman? It was a great time, too, to see Dayna Haines and Ginny Bain, our long-absent WOW members who dropped by for the event. Dayna looks wonderful – would you believe she’s lost 78 pounds?? Amazing!! I didn’t even recognize her. And Ginny looks just the same – slim and pretty! Ginny says she hopes to join us again someday. It may be two years from now, when she retires, but I assured her we will still be here and eager for her words! Nancy Williams, a speaker/writer from Wimberly, visited our meeting to tell us her writing story. <?<span>Nancy is a friend of Dena Dyer and they have the same agent. They met at a conference in Glorietta, <?xml:namespace prefix = st1 />NM. Nancy is a licenses professional counselor who started out writing a column for a local newspaper in The Woodlands called “Keeping Your Balance” and is still writing it now, eight years later. She has a book called Keeping Your Balance – Finding Your Way that is a compilation of some of her columns. She is also under contract with Bethany House for a new book: Secrets to Parenting Your Adult Child. Nancy is working on this book right now. The final copy is due June 1st and it sounds like she’s written about half, so she will be very busy the next few months. Be sure to check out Nancy’s web site: www.nancywilliams.net to learn more about her and her books. Good luck, Nancy, and thank you for visiting with us. Come again anytime you can! We were excited to welcome a new writer from Kerrville, Kathleen Maxwell. Kathleen is the executive director of the Christian Women’s Jobs Corps in Kerrville. She has 3 adult children and lost her husband to cancer in October of 2009. Kathleen has blogged through her grieving process and would like to publish some of her stories to help other women struggling with their grief. Read her wonderful blog at www.themaxwellminutes.blogspot.com. Her writing is warm and very honest. We are so happy that you found us, Kathleen, and we will love being a part of your journey! Linda Colie is recovering beautifully from her shoulder surgery. She is stronger and in much less pain. Linda brought three poems: “Charms,” “Hope Springs Eternal,” and “What Goes Around…” all springing eternally from her charming imagination! Thank you, Linda, for sharing your wonderfully wide talents with us! Sally Clark brought poems. “Spring Lovers” is currently submitted in the Oregon State Poetry Association Spring Contest. “Fresh Baked Bread” is submitted to Alimentum Journal’s Menu Poems contest. “The First Time Ever,” “Go Away and Come Back,” “Then You Will Forgive Me,” “Never Put on Lipstick,” and “True Humility,” will soon be on their way to June Cotner for possible publication in her newest anthology, Wisdom of Women. And here is a teaser – you’ll soon be hearing about a new local poetry anthology that is currently underway, being compiled and edited by Lianne Mercer and Sally Clark! Watch your emails for more information!!! Megan Willome was also there, but needed to leave early. Our deepest sympathies to Megan on the loss of her mother to cancer on March 3. Megan said there were about 1,000 people at her mother’s funeral in Austin. What a testimony to her mom’s life! Megan comes faithfully to TWiG. I’m so glad!!! Sheila Kale was also at the meeting, thank goodness, to offer her advice and encouragement. Sheila has been speaking, which of course means writing first, but her speeches are too long to bring to WOW, so just came to listen. Thank you, Sheila!!! Aimee Martin has been coming to our Tuesday TWiG meetings and is submitting a wonderful story to Guidepost’s Extraordinary Answers to Prayer: In Times of Peril. It is a cliff-hanger! Alice Kolb says: “I'll have to miss the March meeting as I'll be in the middle of an event (a quilting seminar she teaches) -three weeks is too-o long to be out of town!” See you in April, Alice! Happy Birthday Cindy Harper! Her birthday was the night of our meeting and she was out celebrating with her daughters. Judy Koch is also a new WOW member who has been coming to TWiG. Come by some Tuesday and meet her – she’s a lovely woman and a gifted writer! Liz Brookshire was planning to come to the meeting, but had out of town company surprise her Monday morning. Mary Eckert, God bless her, had dental surgery Monday morning in Kerrville, and knew she would not be up to being with us. Hope all went well, Mary! Mary Hartmann is still recuperating in Florida from her car accident. I had an email from her just today saying: “How I would have loved to attend the meeting. Please say Hi for me. Tell all I'm getting better with each passing day. My recovery is slow. They have discovered several budging disks in my neck which will take a long healing. Hopefully, my back will mend and my legs stop hurting. I've been on drugs for quite awhile and have stinky mind. I'm still in Florida and having the Internet at my disposal is still a privilege. My kids are great and loving. I don't know when I'll go home. I want it to be soon. I don't have a car anymore and replacing it will be a challenge.” Please pray for Mary’s recovery! Until then, enjoy the wonderful Spring weather. We surely have a bounty of wildflowers coming our way! !